How Might Democrats Try to Improve and Expand the ACA in 2017? In 2017, if Democrats hold the White House and recapture a majority in the US Senate (control of the US House is considered unachievable), how might they try to change the Affordable Care Act (ACA)? While Democrats and progressive groups have wish lists for ACA improvements, they have kept these low-key, prioritizing instead the need to repel repeated existential threats to the law, such as the 2 anti-ACA lawsuits that reached the US Supreme Court in 2012 and 2015 (National Federation of Independent Business v Sebelius and King v Burwell, respectively). No more. Democratic presidential candidate Hillary Clinton has identified her favored alterations and expansions to the law along with other reforms (https://www.hillaryclinton.com/issues/health-care/). Beyond Clinton, 3 progressive groups issued ACA reform agendas in 2015: the consumer advocacy group Families USA2 and the think tanks Urban Institute3 and The Century Foundation.4 Collectively, these 4 proposals—Clinton, Families, Urban, and Century—offer an emerging portrait of progressive priorities to improve the ACA. What would they do? All 4 plans propose improving affordability of premium tax credits. Clinton’s plan embraces Urban’s proposal to set a maximum 8.5% cap on household insurance costs, including for families with incomes over 400% of the FPL, the current ACA assistance limit. Urban also addresses a poorly recognized feature of ACA premium assistance: Beginning in 2020, the federal government’s spending on premium subsidies, for the first time, will not be able to grow faster than the consumer price index, and individual premium payments will increase as much as 10% per year. This feature, included to control costs in the ACA’s second decade, will make coverage even less affordable if implemented. This will be a key challenge for the next administration. Unaffordable levels of cost sharing face many families with private health insurance, including many in ACA exchanges/marketplaces, a concern for all 4 proposals. While ACA-covered families with household incomes between 138% and 250% of the FPL receive cost-sharing protections, those with incomes between 250% and 400% of the FPL obtain premium support without cost-sharing protections. Many families with employer based coverage face even higher cost sharing. While the ACA set, for the first time, overall cost-sharing limits, these mirror the limits in health savings accounts, topping off at $6,850 for individuals and $13,700 for families. While the ACA eliminated cost sharing above these levels, the number of Americans experiencing cost sharing below these levels has grown substantially. All 4 proposals would address this growing burden. Urban, for example, proposes to set the value of coverage at the more generous “gold” rather than the “silver” Exchange standard. Clinton proposes protections for all Americans—not just those in ACA plans—advancing a new tax credit of up to $5,000 to offset out-of-pocket costs greater than 5% of household income. The so-called family glitch is an ACA provision that deems families ineligible for premium subsidies if the amount an employee has to pay to purchase individual workplace coverage is less than 9.56% of household income. Even though families might qualify for subsidies because the cost of family coverage is above that level, they are still ineligible. An estimated 2-4 million Americans are uninsured because of this intentional (for budget purposes) ACA limitation. All 4 plans propose eliminating the glitch. An underappreciated aspect of health reform has been thousands of Americans, paid and volunteer, who help confused uninsured persons navigate a dizzying array of coverage choices. Many assumed that the need for enrollment assistance would disappear after a few years of implementation. All 4 plans recognize this as untrue—and Clinton proposes allocating $500 million per year for enrollment assistance. The 2012 Supreme Court decision made the ACA’s Medicaid expansion for all low-income persons optional, rather than required, for states. As of June 2016, 19 states have not expanded. For the expansion’s first 3 years, 2014-2016, the federal government paid 100% of costs, trending to 90% by 2020. Three of the 4 plans, including Clinton’s, propose new financial incentives for the remaining states to expand. Each plan includes other proposals, including Clinton’s ideas to allow adults aged 50-64 to buy into Medicare (key details, however, remain undisclosed), and to direct Medicare to negotiate prices with drug companies. The Urban and Clinton proposals both include cost estimates; Clinton’s plans were priced by the Committee for a Responsible Federal Budget at $400 billion over 10 years, with $250 billion in savings primarily by allowing Medicare to negotiate drug prices. What is not in the plans? Little or nothing is mentioned about critical ACA delivery system reforms, or about public health, the health care workforce, and more. A noteworthy omission is any reference to the “Medicare for All” proposal by Senator Bernie Sanders (D-VT) who made this the centerpiece of his presidential campaign. Are Any of These Proposals Feasible? Given the near certainty of a Republican-controlled House in 2017, it is reasonable to question the political viability of these ideas. Since 2011, the House majority has voted 60-plus times to repeal all or parts of the ACA. Recent policy proposals advanced by a House Republican task force continue this trend. What might change in 2017? First, President Barack Obama’s departure from office might create a more receptive climate for bipartisan cooperation. Second, a Democratic president’s election in 2017 would eliminate any possibility of ACA repeal until 2021 at the earliest, by then the eighth year of full coverage expansion, when the expansions would be institutionalized and harder to rescind. Third, as noted earlier, since 2010 numerous ACA provisions have been repealed, delayed, or modified based on Republican proposals. Each change resulted from political give-and-take involving the president and both houses of Congress. Table 1 identifies an emerging set of priorities for the Democratic side of any future negotiation. Turner GM. Seventy changes to ObamaCare . . . so far. 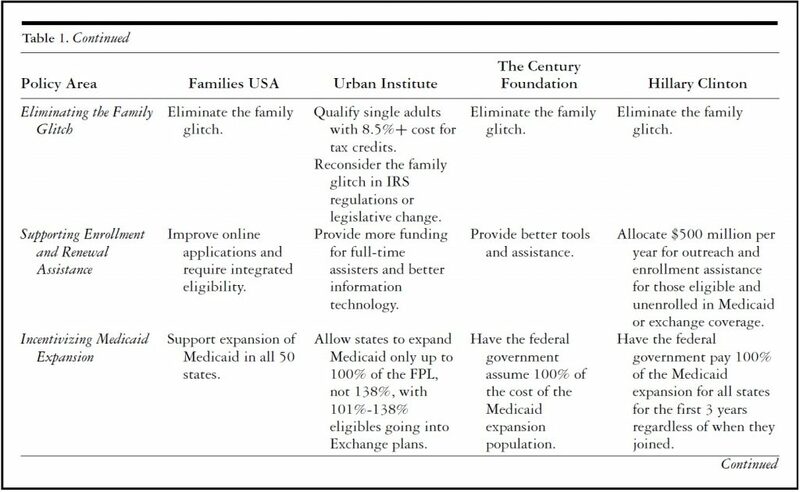 Galen Institute; 2016. http://galen.org/assets/70-changes-so-far-to-ObamaCare-1.pdf. Accessed June 10, 2016. Families USA. Health reform 2.0: a call to action. 2015. http://familiesusa.org/sites/default/files/product_documents/HealthReform-20_final_web.pdf. Accessed June 10, 2016. Blumberg LJ, Holahan J. After King v. Burwell: next steps for the Affordable Care Act. Urban Institute; 2015. http://www.urban.org/research/publication/after-king-v-burwell-next-steps-affordable-care-act. Accessed June 10, 2016. 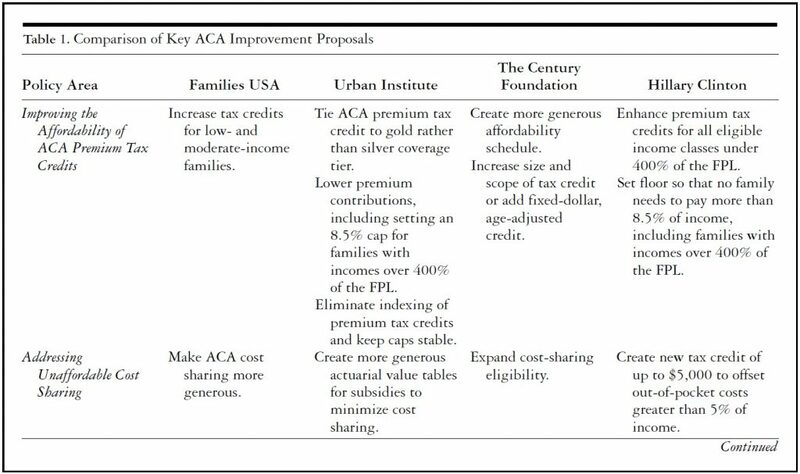 Jost TS, Pollack H. Key proposals to strengthen the Affordable Care Act. 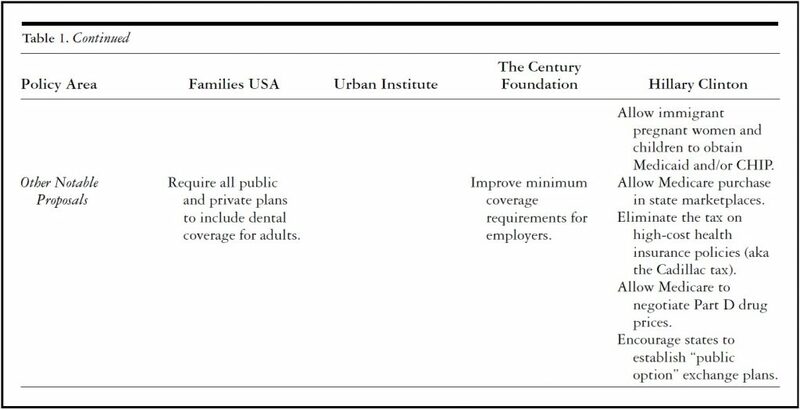 The Century Foundation; 2015. https://tcf.org/content/report/key-proposals-to-strengthen-the-aca/. Accessed June 10, 2016. Garfield R, Damico A, Cox C, Claxton G, Levitt L. New estimates of eligibility for ACA coverage among the uninsured. Kaiser Family Foundation; 2016. http://kff.org/health-reform/issue-brief/new-estimates-of-eligibility-for-aca-coverage-among-the-uninsured/. Accessed June 10, 2016. John E. McDonough, DrPH, MPA, is a professor of public health practice at the Harvard University TH Chan School of Public Health in the Department of Health Policy and Management. Between 2008 and 2010, he served as a senior adviser on national health reform to the US Senate Committee on Health, Education, Labor, and Pensions, where he worked on the writing and passage of the Affordable Care Act. Between 2003 and 2008, he was executive director of Health Care For All, a Massachusetts consumer health advocacy organization, where he played a leading role in the passage of the 2006 Massachusetts health reform law. From 1985 to 1997, he was a member of the Massachusetts House of Representatives where he cochaired the Joint Committee on Health Care. His articles have appeared in the New England Journal of Medicine, Health Affairs and other journals. He has written several books including Inside National Health Reform in 2011 and Experiencing Politics: A Legislator’s Stories of Government and Health Care in 2000, both by the University of California Press and the Milbank Fund. He holds a doctorate in public health from the University of Michigan and a master’s in public administration from the Kennedy School of Government at Harvard University.